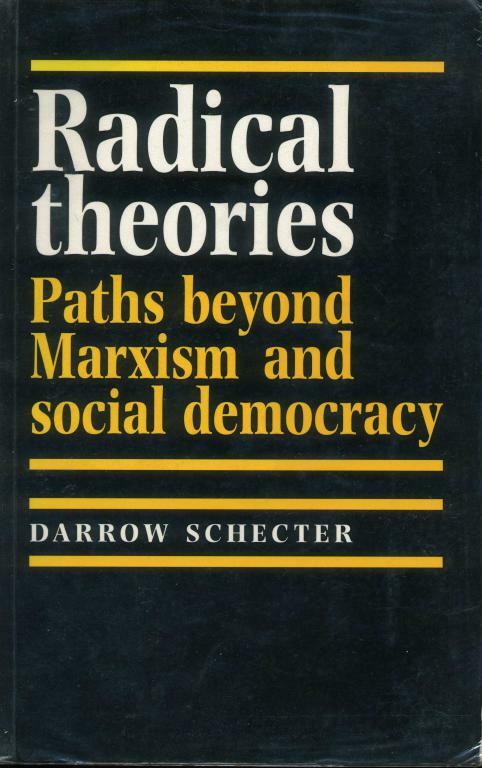 This is a chapter 'self-management and the case for workers' co-ops' from Radical theories: Paths beyond Marxism and social democracy (1994) by Darrow Schecter. This study is being shared for critical consideration. In the previous chapter we saw how the Guild socialists were concerned to safeguard producer autonomy from both the State and the tyranny of private interests. In the writings of G. D. H. Cole this implied a role for a modified market to facilitate direct exchange of goods between producers. It became clear that the particular kind of market advocated by Cole was highly unusual, featuring a negotiated price and a continual dialogue between producers, distributors and consumers. Cole intended that producer autonomy be reconciled with high standards of craftsmanship reminiscent of the Guild era, as well as full producer responsibility to the interests of the local community. But trade union scepticism, the depression of the 1930s and general confinement of Guild socialist ideas to intellectual circles spelled the eventual failure of Guild Socialism as a political movement. The post-World War II world was not long in existence, however, before the demand for non-statist Socialism was once again heard - this time in Yugoslavia. This chapter will examine the Yugoslav experiment in self-management and the origins of contemporary Market Socialism in post-war Europe. It will conclude with an assessment of the current theoretical debates on the feasibility of combining a market economy with socialist ideals of participation and accountability of power. By freely combining their work in the basis of social assets and self-management, the working people in an enterprise organize and constantly expand production, trade, or other economic activities, so as to satisfy their individual and collective interests and the general interests of society. Such events would seem to point to a fairly negative assessment of Yugoslav Market Socialism, and lead us to question the validity of the premises underlying the model itself. Yet this must first be weighed against the very successful performance of workers' co-ops in Italy and, especially, in Spain. Our final assessment of market socialism would be incomplete without an examination of these developments. Whether State- or privately owned, the underlying assumption is that whoever controls the means of production - the State or private capitalists - has the right to organise work and determine all major questions on wages and investment. Workers' Councils within planned economies and trade unions within capitalism may contest the prerogative to some extent, but power ultimately remains in either State or private hands. This is even true when enterprises in a capitalist private enterprise system are nationalised. The co-operative sector of the Italian economy is so large, that co-ops dominate industry in parts of central and northern Italy, and account for 10 per cent of production nationally in the building industry. As such they offer us a picture of the successes that co-ops can have within predominantly capitalist economies. The Italian co-ops also illustrate the severe limitations on co-ops as primary vehicles for a more general democratisation of Civil Society. It has become clear that while a co-operative sector of the economy is certainly necessary for the democratic organisation of work and the widest possible dissemination of ideas, the co-op movement leaves larger political questions unanswered. Many of the problems that we have already discussed in relation to the effects of the market in Yugoslavia also arise in other contexts such as Italy and Spain. Let us look at these difficulties for a moment. The political culture which sustains Mondragon, similar in many ways to the post-war communist culture of Emilia Romagna, provides the soil in which producer and consumer co-ops can flourish. It is a culture forged through common experiences and struggle over a long period of time. Its network of social clubs, support groups, and neighbourhood associations constitutes the kind of Civil Society in which a democratised economic system can work for the benefit of the whole community. A strong sense of independence and co-operative values are needed to sustain this kind of Civil Society against attempts at bureaucratisation by the State. Moreover, such consciousness is also necessary to ensure that the centrifugal forces of the market can be contained within their proper limits. Thus it would clearly be wrong to attribute the solidaristic characteristics of the Mondragon system to the existence of the market. As we have seen, the market is often praised for its efficiency in allocating resources, but the market will also produce results that are not compatible with the socialist values of participation and accountability. The key point is this: without the network of social institutions in which it is embedded in the Basque region, the market would have the same effects as it has had in Yugoslavia and elsewhere: regional inequality, class exploitation and political inequality. Recent theoretical work on Market Socialism has made strong claims on behalf of the market's ability to allocate resources efficiently and to protect consumer interests, but what we already know about markets is that they generate vast disparities in wealth, power and life-chances. In the conclusion of this chapter I would like to address this point in relation to recent market socialist theory. Miller, Market, State and Community, p. vi. See also Holmström, Industrial Democracy in Italy. Holmström says: 'The Market is not incompatible with socialism but essential to it' (p. 157). Nove, The Economics of Feasible Socialism, pp. 10-15, pp. 77-8. For the sources of Yugoslav theory and the stated aims of self-management see Kardelj, Democracy and Socialism, pp. 7-10; Zukin, Beyond Marx and Tito, pp. SD-4; Drulovic, Self-Management on Trial, pp. 199-202; Smidovnik, 'Disfunctions', pp. 27-9. Lydall, Yugoslavia in Crisis, pp. 1-2. Drulovic, Self-Management on Trial, pp. 37-9. Drulovic, Self-Management on Trial, pp. 40-2; Lydall, Yugoslavia in Crisis, p. 2. Drulovic, Self-Management on Trial, pp. 43-4. Vanek, 'The Worker Managed Enterprise', p. 257. Vanek, 'The Worker Managed Enterprise', p. 258; Zukin, Beyond Tito and Marx, pp. 258-9. Vanek, 'The Worker Managed Enterprise', pp. 258-9. Vanek, 'The Worker Managed Enterprise', pp. 260. Quoted from 'The Constitution of the Socialist Federal Republic of Yugoslavia' (1959), now in Vanek, Self-Management, p. 71. Vanek, 'The Worker Managed Enterprise', pp. 266-77. Lydall, Yugoslavia in Crisis, pp. 14-15. Vanek, 'The Worker Managed Enterprise', pp. 269-70. Lydall, Yugoslavia in Crisis, pp. 111-12; Masmak, 'From the New Social Movements', pp· 59-61. Nove, The Economics of Feasible Socialism, pp. 137-40; Comisso, Workers' Control under Plan and Market, pp. 46-8; Selucky, Marxism, Socialism and Freedom, pp. 113-14. Mastnak, 'From the New Social Movements', pp. 53-4. Oakeshott, The Case for Workers' Co-ops (second edition), p. 248. Holmström, Industrial Democracy in Italy, pp. 18-19; Vanek, General Theory of Labour Managed Market Economies, pp. 4-5. Holmström, Industrial Democracy in Italy, p. 46; Horvat, The Political Economy of Socialism, pp. 65-70. Holmström, Industrial Democracy in Italy, pp. 10-11; Horvat, 'An Industrial Model', pp. 127-8. Vanek, 'Introduction' to Vanek Self-management, p. 35. Perhaps of equal importance are points 11 and 12. which stress that self-management is more than a set of economic premises, but rather an entire philosophy of education and politics which aims at advancing our understanding of democracy beyond the terms offered by concepts like Socialism, Communism and capitalism (p. 36). Oakeshott, The Case for Workers' Co-ops, pp. 120-1; Demoustier, Les Cooperatives de Production, pp. 5-7; Thornley, Workers' Co-operatives, p. 135. Oakeshott, The Case for Workers' Co-ops, pp. 141-3. Thornley, Workers' Co-ops, pp. 143-4. Thornley, Workers' Co-ops, pp. 152-3. Oakeshott, The Case for Workers' Co-ops, pp. 160-1; Holmström, Industrial Democracy in Italy, pp. 52-3. Holmström, Industrial Democracy in Italy, p. 68. Thornley remarks that former Lega chief S. F. Carpanelli's view is that the co-op movement did not create the capitalist system, but has no choice but to work within it. She writes: 'As businesses which are competing in this system, co-operatives are primarily a sector of the economy and not a force for building socialism.' See Thornley, Workers' Co-operatives, p. 158. For Carpanelli's and other views on the Italian movement, see Carpanelli, L' autogestione nell'industria. Oakeshott actually sees such developments as positive signs that co-ops are finally shedding their 'cloth cap' image. See Oakeshott, The Case for Workers' Co-ops, p. 162. Mellor, Hannah, and Stirling, Workers' Co-operatives in Theory and Practice, pp. 148-9; Holmström, Industrial Democracy in Italy, pp. 75-7. Nazario Galassi, La cooperazione imolese, p. 169; Holmström, Industrial Democracy in Italy, pp. 123-4, and p. 139. Holmström, Industrial Democracy in Italy, p. 7. Holmström, Industrial Democracy in Italy, pp. 7-8. The CLP was founded in 1959 as a credit co-op. It was designed to provide financial, technical and social assistance to those co-ops associated with the bank as well as to individuals. For a detailed analysis of its functioning, see Thomas and Logan, Mondragon, pp. 76-7. Oakeshott, The Case for Workers' Co-ops, pp. 178-85; Mellor, Hannah and Stirling, Workers' Co-ops in Theory and Practice, p. 63. On this very important point see Thomas and Logan, Mondragon, chapter 4; Holmström, Industrial Democracy in Italy, pp. 7-8. Oakeshott, The Case for Workers' Co-ops. pp. 186-7, and p. 204. Oakeshott notes that there is a slight complication in all this, due to the formation in 1966 of the ULARCO federation of co-ops next to the ULGOR co-ops within the umbrella of Mondragon co-ops. However, he adds, the ULGOR arrangements are still representative of Mondragon practice as a whole, and continues to constitue a good general model. Oakeshott, The Case for Workers' Co-ops, p. 190. Oakeshott, The Case for Workers' Co-ops, pp. 168-9; Thomas, The Spanish Civil War, pp. 86-90; Fraser, Blood of Spain, p. 536. Oakeshott, The Case for Workers' Co-ops, pp. 206-9. Bradley and Gelb, Co-operation at Work, pp. 64-9. Richter, 'A Socialist Market Economy', pp. 186-9, and p. 196. Miller, Market, State and Community, pp. 9-10; see also Miller's article 'Why Markets? ', pp. 45-8. Miller, Market, State and Community, pp. 93-4. That in fact the market is not efficient in these matters has been cogently argued by O'Neill in 'Markets, Socialism and Information', pp. 206-10. See also O'Neill's 'Exploitation and Workers' Co-operatives', p. 234. Thus Frank Roosevelt concedes that 'With resources often idle at the same time as there are unfulfilled human needs, a market economy can be said to be both irrational and wasteful.' See Roosevelt, 'Marx and Markets', p. 515. Co-operatives: all in this together?